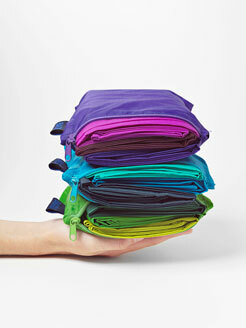 Give your shopping excursions a burst of pep with playfully colorful and ultra stylish reusable bags from Baggu. The collection is characterized by a highly functional design approach that has been flawlessly executed in a trendy eco line brought to us in a wonderful assortment of colors and patterns. Minimizing the waste of plastic and paper shopping bags is a huge step we can all make to help our environment. 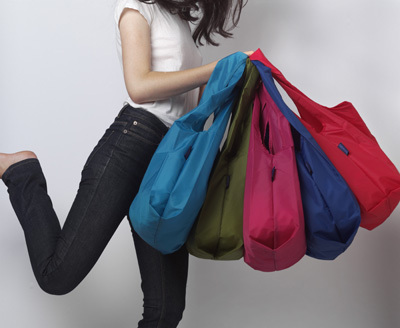 And after you take a look at the sleek eye catching designs of Baggu, how can those icky plastic bags even compare. The original Baggu design – “The Baggu” is a sturdy construction made of rip stop nylon- a durable eco friendly material produced ethically in China. The straps were made thicker for longer wear plus comfort. 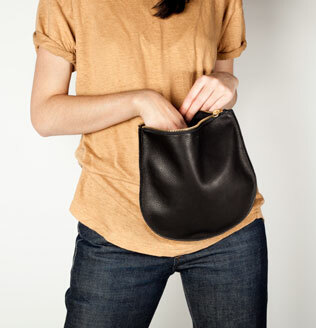 The design patterns are cut to reduce material waste and the pouch is made from scrap fabric. 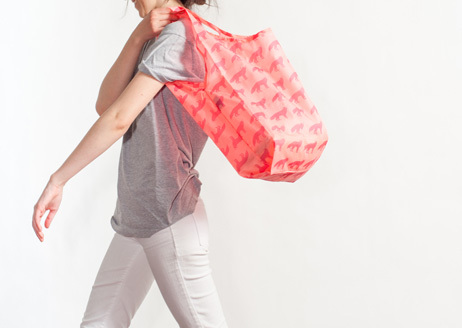 Because Baggu is so lightweight – it’s carbon footprint in traveling is very small. Plus Baggu encourages their customers to send in their expired Baggu bags for recycling and receive $1 credit towards their next purchase. Designer, Emily Sugihara and her mom took great care to design a distinctive collection as a fabulous alternative to the disposable bag, great for trips to grocery store, plus so much more- with a design so versatile you’ll also love to use it whenever you can- for travel, the gym, the beach, the trail, in the mountains, city or country- it’s perfect for all situations. The reusable bag from Baggu is definitely a must have for its design, quality and ability to fit right into our lives, making it so easy and stylish to make a positive impact on the environment on a daily basis. We are delighted that Baggu has extended their collection to include tzipper bags, backpacks, ipad/laptop sleeves plus leather bags, purses and pouches- all continuing to deliver Baggu’s signature attention to design and commitment to environmental responsibility. You’ll love to select through their wide range of beautiful colors and prints and you can also do your own screen print custom bags. 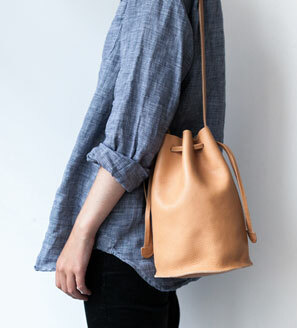 Spring and Summer is definitely a great time to stay tuned to Baggu! There are so many exciting possibilities, including a fantastic collaboration with Mer Bags and the new summer pop up shop now open in Williamsburg.